Posted On Tue, 19 Jul 2005 06:39:00 +0000. 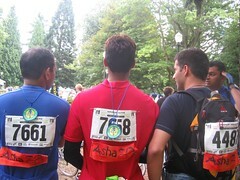 Filed in asha, volunteer. By Vaibhav Bhandari. RajiMadeTheTags Originally uploaded by vbha. The original plans was to have two tags “Wheels of Change” and “Asha - working for education of underprivileged children in India” but in a days notice Raji could just get “Asha” lovely organge tags and she had to literally burn mid-nights oil for this.